Remember the View-Master? A few weeks ago, rumors started circulating that Google and Mattel might be bringing an updated version of the stereoscopic toy to market, and now it’s finally arrived. The new View-Master supports Google’s Cardboard virtual reality platform virtual reality platform, which provides a 3D view of various sights around the world – even outer space! The toy utilizes 360 degree photospheres, similar to what Google does with Street View. What makes the View-Master different from other VR products, however, is its “experience reel”. Similar to how older versions of the toys had a carousel of photos covering a specific theme or place, the reimagined product can be paired with different reels to show its users different environments. Of course, given its 2015, there’s an app for it too. Google and Mattel have even made a short introductory video. We have to say though, it’s a bit odd to end the video with Alcatraz prison, given View-Masters are generally marketed at kids. Still, it was originally meant to be something people of any age could enjoy when it was introduced in 1939, so to each his own. Since it runs on Cardboard, users will need an Android smartphone to use the View-Master; Cardboard works by splitting your phone’s screen into two images – one re-directed into each eye – and then using your phone’s sensors to provide motion detection. 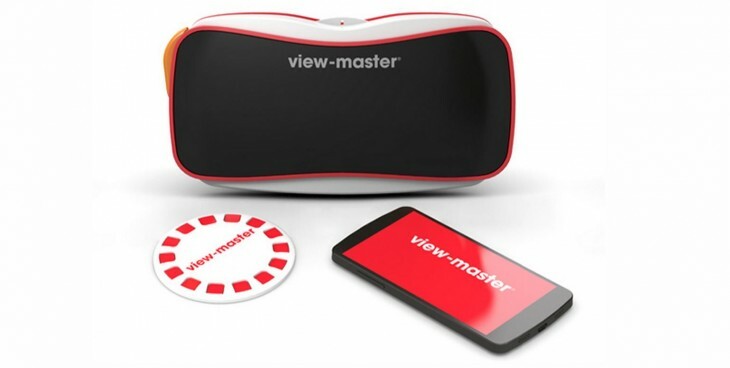 The new View-Master will be available in fall 2015 for a suggested price of $29.99 (smartphone not included). A sample reel will come in the box, which includes a gallery of classic View-Master images, a space trip simulation and the chance to visit a “unique destination” in 360 degrees. Other themed experience reels will be sold for $14.99. The View-Master introduced many a generation to 3D as kids, so it’s the perfect product to bring virtual reality to a new generation.